Deep cold, falling snow and ice... One expects such things in February. There are times when skies at sunrise are clear and bright blue, and they seem to go on and on forever. More often, heavy clouds conceal the sky, and all the north is a tempest of blowing white. I've written of such winter days: fey intervals when a winter squall appears out of nowhere, and the lake and its frozen gorge are so quiet one can hear snowflakes falling and coming to rest among the trees. When asked why I live where I do, I usually mention the perfect flaming autumns here, but I should be talking about the glorious winters. Every single one is a marvel. I arose early a few days ago, looked out the window at the storm coming in and fumed silently. It was not the weather that made me surly and a tad morose, it was the absence of light. Clouds blanketed the sky from horizon to horizon, and the sun was completely blotted out. This far along in a northern winter, one will do almost anything for a little light. The cure for the winter peeves and gloomies is simple - get out the parka and heavy gloves, brew a flask of tea, grab snowshoes and camera, then make tracks for the gorge above Dalhousie Lake. The winding road to the lake is slick with ice and treacherous driving, but the scenery is grand, and balm to a winter weary spirit too, an essential element in this ardent and arduous journey into the wild. This year, my treks are brief, but they are magical nevertheless. 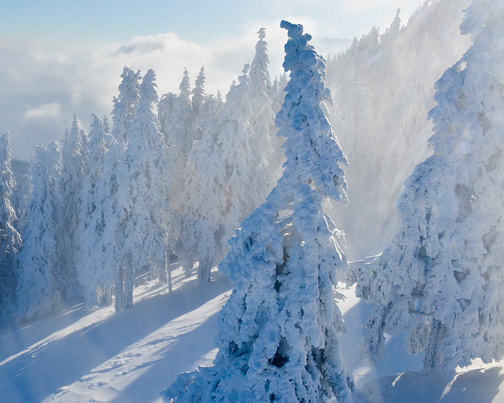 The trees on the heights are manitous watching over the frozen landscape in robes of white. Behind them all is blue sky and blowing snow. Sometimes standing up there feels like being in the high Himalayas, but, of course, no trees grow on the roof of the world. From the edge of the lake below, one sees little or nothing of the far shore for torrents of blustery white. The gorge's granite walls amplify sound wonderfully, and the north wind speaks (or sings) volumes as it makes its way down the deep corridor of old stone. Joints protesting, I bend to look closely at the snow on spruces at the bottom of the ravine, and every suspended crystal is a sea of light. When I catch a flake on my tongue, it tastes like champagne. Who was that flaky female mourning the absence of light a few hours ago? One thing is certain - the English language could use a few more words for snow. A beautiful photo and wonderfully evocative passage. Yay you...getting out to see, using a vehicle to get there! And then blessing us with your picture and thoughts. Thanks! Have a great day! As your soul benefits, so do ours. We are lucky readers indeed.